Obstetrics and Gynaecology are the oldest among medical sciences, for it should have begun with the very primitive humans. Over the past few centuries it has evolved as the most advanced medical science ensuring that childbirth is not a matter of life and death. Maternity wards and hospitals across the world are mostly continuing to record either nil maternal/infant mortality or very negligible of rate of mortality, except in some underdeveloped countries among most backward communities. Reminiscent of the scenario in maternity wards and hospitals two centuries ago, it is worthwhile remembering that brilliant medical crusader in Vienna and Budapest in the 1980s, Ignaz Philipp Semmalweis, whose passionate struggle against the appalling ignorance and bigotry that doomed one woman in three to die during child birth. His epoch-making discovery was literally a gift of life to millions. The discovery came at a time when there were no gleaming tiles, no equipments/machines, no sterilizers, no rubber gloves, no antibiotics, no wonder drugs and wards unclean with bed clothes inadequate and indifferently washed. The highly successful prophylactic hand washing among medical professionals and other staff handling childbirth made him a pioneer in discovering antiseptics. There are many exemplary obstetricians and gynaecologists in Sri Lanka who are walking in the footsteps of great men like Semmalweis to maintain strickt cleanliness in maternity wards and hospitals to save lives. Under the free state medical care system in Sri Lanka, much focus has been laid on obstetrics and gynaecology as a concerted effort towards building a healthy society and there are many exemplary obstetricians and gynaecologists who are walking in the footsteps of great men like Semmalweis and contribute their share towards the achievement of the government's objective. 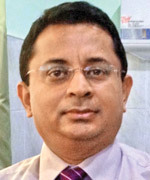 Dr.Sanath Lanerolle, Consultant Obstetrician and Gynaecologist attached to the Chilaw General hospital has been long observed to be one such exemplary medical professionals who has contributed immensely towards making the two maternity wards in the hospital a very safe and pleasant place for pregnant mothers during their confinement. The doctors, nurses, midwives and other staff in the wards are caring and pose a smiling face to the mothers and visitors alike in spite of their heavy work schedules, thanks to the relentless efforts of Dr.Lanerolle for his relentless efforts to change attitudes. The wards are clean, medical equipments are readily available and there is an altogether different and pleasant atmosphere compared to maternity hospitals and wards in many other hospitals. 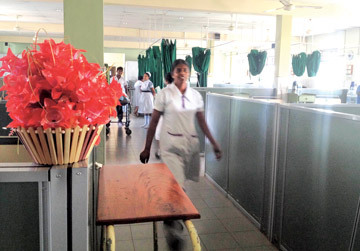 “Chilaw general hospital is one of the premier hospitals in the Puttalam district and it serves a population of about about 400,000. Medical professionals in the two maternity wards deliver about 400 babies per month. Prior to my arrival in the hospital as obstetrician and gynaecologist there was only one maternity and there was congestion. I have been alter this situation by taking efforts through the medical authorities to add one more ward and maintain cleanliness and an pleasant atmosphere with the help and cooperation of all my medial staff and others. The second ward is a newly developed and transformed ward and we have been able to get over the earlier congestion and rush. This new unit has its own labour room and there are 40 beds for pregnant women and 20 of them are for mothers and babies after delivery. The labour room is equipped with all state-of-the-art modern machines and equipment that support the mother and baby while distress. “One of the most significant achievements is the ‘change in the attitude’ of the medical staff and others. In fact training was imported in a systematic manner to the doctors, nursers, midwives and the minor staff. "The most wonderful thing that I have achieved is change of attitude towards the pregnant women and such a change of attitude has a very big impact on patient care. I am happy to say that patient care level has been transformed to a very high standard. The patients themselves or their relatives will vouchsafe on this success story. The wards are very clean and on par with many private hospitals. The wards are sterilised and the babies do not have any kind of infection. The mothers are going home with minimal problems in relation to their deliveries. Absolutely there is no infection have been recorded. I am proud of this ward and my staff. Specially I want to thank the Nursing in-charge Mrs.Jayalath for her cooperation and help she extended towards developing this wards as well to the Director of the Hospital Dr.Dinusha Jayasinghe . "When I came here in 2012 there was only one ward and I found that it was not a good place for the mothers coming for deliveries. Some Sri Lankan expatriates in the US donated four labour room beds worth about Rs.300,000. "A. Baur & Co. provided the furniture on my request and other than that there were other contributions from well wishers. "The Family Health Bureau and the Sri Lanka College of Obstetricians and Gynaecologists also extended us support."